The Sealine F43 Flybridge represents the definitive aft-cabin performance motor yacht for her size - This is arguably Sealine’s most popular model! Offering superb spacious accommodation with a comfortable main saloon, roomy aft owner’s en-suite stateroom and forward guest cabin. There is a deep, safe aft cockpit having all-round seating, with storage for the cockpit table and canopy in the flybridge moulding. Moulded teak laid steps allow safe, easy access to the flybridge seating and sunbed area, and the commanding helm position provides excellent control with all round visibility. Fitted with twin Volvo Penta 370HP TAMD 63P Diesels giving a potential top speed of approximately 28/30 Knots, and conventional shaft drive giving easy and predictable slow speed handling. She has just come on to the market with Barbican Yacht Agency and is in the process of being prepared for sale and is very attractively priced for a quick sale. Twin Volvo Penta TAMD63P 370hp diesels easily accessed by steps from the saloon. Well appointed accommodation fitted with carpets and curtains and attractively finished in maple veneer with hardwood edgings. Light and airy saloon with 'U' shaped settee to starboard, adjustable coffee/dining table, two seater settee, bar area with television, and fridge opposite to port, radio/CD player, raised helm position to starboard, with full instrumentation and overhead switch panel in burr walnut. Forward guest cabin with double berth, dressing table, hanging locker and ample side lockers, overhead hatch with blind. En-suite access to forward heads/shower compartment. Forward head with sea toilet, wash basin, shower and storage lockers, accessed from either guest cabin or saloon. Galley to port with Smev gas oven and grill, two burner gas hob, twin sinks and several storage lockers. Utility/extended galley worktop area opposite the galley to starboard with extensive worktop and locker space. Owners stateroom aft with island berth, large wardrobe with full length mirror, dressing table, heads compartment to port with sea toilet and wash basin, separate shower room to starboard. Teak laid cockpit with 'U' shaped seating in grey fabric with burgundy piping, removable central table and teak laid steps to the flybridge. The flybridge is also teak laid with double helm seat, 'L' shaped seating and large sunpad. Flybridge cover and full cockpit enclosure in burgundy fabric, both new in 2015. 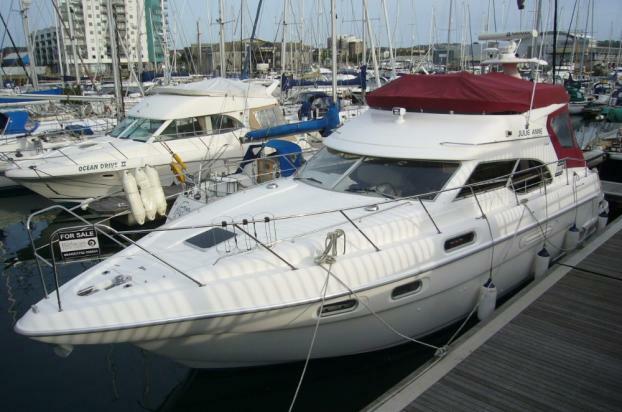 Built by Sealine International Ltd. Kidderminster, UK. GRP construction with teak laid cockpit and flybridge.